Text: An American visitor to this country, when asked what he thought of the Derby, guessed that it had come to stay. Something of the same might be said about television; the fact is that television is no longer merely experimental; it is an amazingly accomplished fact. It is true, of course, that television must remain experimental so long as it is limited by the money the Department has to spend, and as it is expensive listening hours must be, for the time at least, limited. It is also true that television sets are expensive and we must not expect to find one in every back parlour just yet. But the same was true of gramophones and wireless sets and is still true in a degree of home film projectors. But one experience of an outside broadcast by television is quite sufficient to convince anyone that television has come to stay. I can remember, it must have been about 1922, hearing a man say, when listening to a crystal set, that he did not believe for a moment that the B.B.C. were so foolish as to have an orchestra in the studio. He was convinced that when the announcer told us that we were to hear a Symphony Orchestra that an engineer merely played a gramophone record. He failed to appreciate that the playing of a gramophone record did not detract from the miracle of radio but, if anything, added to it. The B.B.C. have since proved this. The significant fact is that radio is a means of mass communication and that while the old gramophone filled the homes of individuals, the gramophone by radio filled the homes of the nation. It will therefore be no detraction from the marvel of television if the B.B.C. make use of film, and indeed I hope they will make more and more use of film. If they did little more than carry the already considerable mass of documentary, instructional and travel films to the millions of people whom these films normally pass by, they will have done something worthy of achievement. But already they are doing much more than this. Radio in general, in spite of the arty and crafty hokum which has surrounded a number of programmes, continues to be significant for two reasons. One is that it is the most universal means of mass communication, and second there is its immediacy. Radio can report within the split second; so, too, can television. 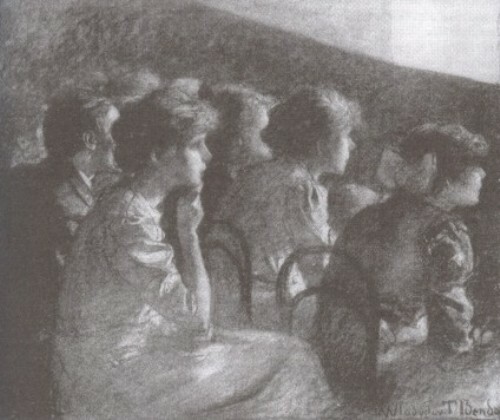 The most exciting broadcasts have been the outside ones such as The Derby, The Trooping of the Colour and The Boat Race. While the mass communication of these programmes might be limited to merely thousands of sets, the immediacy was electric. Newsreels seemed historical records the day after one had seen the Derby by television. The Test Match broadcast indeed made most newsreels look pretty silly. Here, with no time lag, was a brilliant account of the excitement of the game, and the amount of detail picked up by the carefully handled cameras was magnificent. The television camera cannot make a cut in the film sense but the quick mix from bowler to batsman was an indication that television had something of its own to offer. All this is merely a confirmation of something that radio has demonstrated again and again. The biggest listening audiences, I believe, are for the King’s speech on Christmas Day and for the nine o’clock broadcast of football pools results from non-B.B.C. stations. Research figures are reputed to show that there is a very large audience for the news bulletin, the weather forecast and for any major sport event. This seems to indicate that the public do rely on radio in the first place as a news agency in the widest sense of the word. In spite, therefore, of the enthusiasms of some for the Foundations of Music and the Experimental Drama hour, I remain convinced that the very stuff of radio can be made out of its ability to tell all the people all about everything all the time — and no fooling. Television, even in its present form, does this admirably with an immediacy and an intimacy denied to any other medium. It would be well if the television department concentrated on this signal service in their near developments. (1) It was a play which we all knew. (2) It was done in modern dress. (3) It introduced the penumbrascope. It is a great play. As it is written it depends chiefly on the actors and the words. On or off the stage the same criterion applies to the speeches. If they are well spoken half the battle is won. Most of the actors did well, but as usual, Caesar himself proved the most difficult part and as usual was the least satisfying. So much for the criticism which must obtain in any presentation. What had Television to offer that the stage had not? Mr. Dallas Bower, who claims some affinity with the cinema, was able to add a point or two. He dubbed the soliloquies, which was a good idea, but he did not make the distinction between the oratorical soliloquies and the subjective ones. His technique was successful so long as it represented the sub-conscious prompting of the mind in Cassius and Brutus but it failed when applied to the soliloquies which served as Chorus. Mark Antony informed the audience of the progress of his plan through sealed lips. The super-imposed ghost, the rioting scenes and the war scenes taken from film were the kind of things we expect Television to produce, and the standard offered by film must be, if not the criterion, then the objective. There was nothing significantly televisual in the modern dress approach but it was a good idea and worked out as well as the text would allow, though why Brutus and Cassius did not use their six-shooters on Caesar I cannot imagine. The penumbrascope, on the other hand, suggests great possibilities. Space and depth are difficult in a small studio and these limits bind the scope of any production. The penumbrascope which produces a shadow cyclorama does not yet give scale to the small studio but it does produce a method of quick change of scene in close-up and mid-shot. It can change mood with increased facility and I fancy it is less expensive than scenery. It needs to be worked out with more regard for the general lighting scheme and it would probably show up better with simpler foreground lighting. There were times when the stage seemed very crowded and I wondered why Mr. Bower did not raise one of his cameras to a higher angle after the fashion that the newsreel camera oversees a procession. A wider angle of incidence of the cameras would improve the difficult mix from close-up to long shot. I can imagine that their Drama will require to invest itself with something of this spirit if it is to be anything different from the stage or from the cinema. On the grounds of mass communication I can see no reason why television should not broadcast films or broadcast stage plays. I think they are perfectly justified to spread these two media in a fashion which is within its power only. In these cases the test of quality beyond technicalities must obviously be the test supplied normally to the stage and to films. Already we have had evidence of this. Well-written stage plays televise well: badly-written stage plays are equally bad on the air. When we come up against something like D.H. Monro’s version of a Russian Ballet rehearsal, we have got something which is bringing alive this peculiar quality with a spontaneity and immediacy which belongs lo television. This production eavesdropped on reality. It was television doing its own peculiar job and therefore television at its own very best. Comments: Thomas Baird was a British film journalist and documentary film executive, who worked for the Ministry of Information in the 1940s as its non-theatrical film supervisor. He wrote a monthly column for World Film News on the new medium of television. 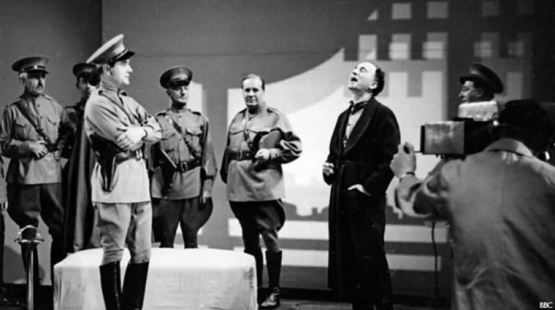 Dallas Bower, one of the pioneering creative figures of British television drama, directed and produced a 110-minute production of William Shakespeare’s Julius Caesar, in modern-dress (reflecting Nazi Germany), broadcast by the BBC on 24 July 1938. Ernest Milton played Caesar. Penumbrascope was a form of shadow projection. Direct cuts between shots were not possible with television studio technology at this time; instead there would be a transitional ‘mix’ between shots which could take between two and four seconds. This entry was posted in 1930s, Film journals, United Kingdom and tagged Julius Caesar (1938), Literary adaptations, Newsreels, Outside broadcasts, Sports, Television, Thomas Baird. Bookmark the permalink.